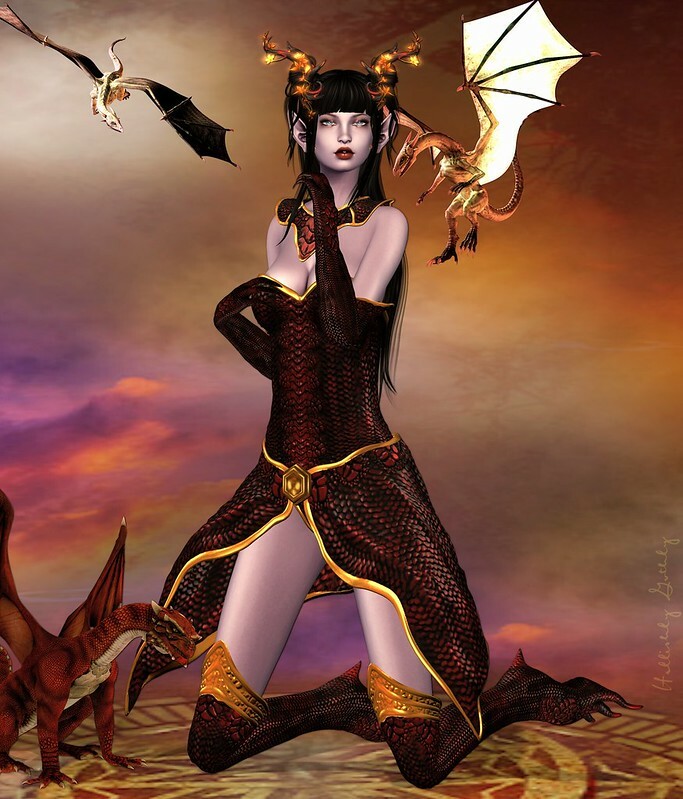 Like I guess most people I just love dragons. So when I saw this gacha by .AiShA. at Fantasy Gacha Carnival I could not resist. It is called Dragonia, and has 3 colours, plus a gold ultrarare, and has 4 parts, plus rare head and rare legs both of which are colour change through a HUD. The one I am showing is called Drogon, and is a gorgeous red colour with gold accents. The texturing on this is fantastic, it looks like dragon scales. The skin I am wearing is by Lumae, and is the first of her complete new range of skins. What can I say about this, it is stunning! This one is called Nightwish and is available at We <3 Role-play. (she also has a more human skintone as a group gift). It comes with almost every applier you could need both for body, and head. It also comes with the fabulous elf-ears you see here. The skin doesn't have any make-up so it makes an absolutely fabulous base skin for adding make-up to also. The eye-shadow I am wearing is by Gret by Zibska, and is available at Uber. Appliers included are Lelutka, Catwa, plus standard tattoo. Personally, I am so pleased she now does Omega appliers so they work with my Logo head. My hair is a great new group gift by Truth. It is a complete fatpack, and the style is fabulously versatlie.